Three clowns putting on their makeup. Marc Sheris is on the left. Howard Walberg is on the far right and Chris Glancy in on the near right. We would typically start work at 9:30am and be dressed and ready for the guests at opening time at 10:00am. It usually takes more than 30 minutes for makeup and costume, so we had to get started earlier--around 9:00am. This picture was taken on August 28, 1982. Where was this dressing room located? This year the clown and body puppet dressing area was in a room in a large building in an employee only area. It was sort of close to where the Parachute ride was--which (I think) was being build during the 1982 season. The clown and body puppet dressing was in a trailer in 1981 and still at a different location from 1983 to 1985. This was in the original employee wardrobe area of the "old admin" building. 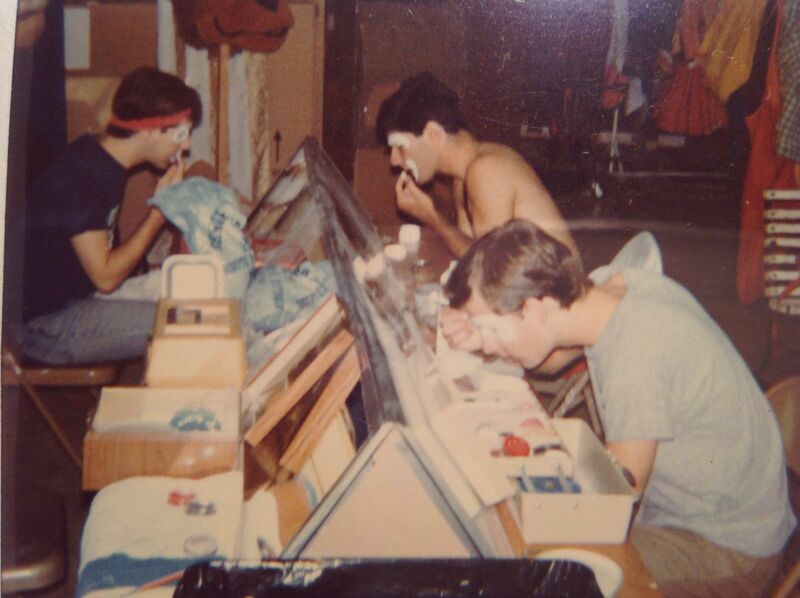 Costumed characters used this in 1982 and 1983 after the New Wardrobe building was completed at the admin area. Is "greg90" Greg Gillette? I submitted a number of pictures from my time working as a clown at Great Adventure. You may be in some of them.